When Max Abraham and Henri Hinrichsen were working to develop a small music publishing house no-one dreamed that their company would one day achieve world wide status. Called C.F. Peters and based in Leipzig they worked to create the "excellence in music publishing" that has since become the watch word of Edition Peters. 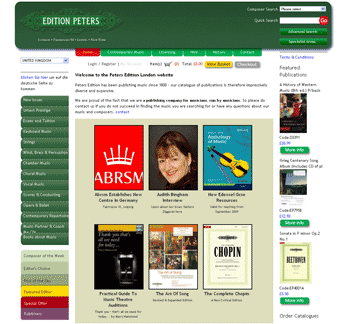 After 200 years in music publishing Edition Peters are currently able to offer the most comprehensive range of sheet music currently in print. Now based in London, New York, Frankfurt and Leipzig, Peters has grown to a point where the company is unrecognisable from its humble beginnings. To control the complex structure of its music publishing business, including the many thousands of items of sheet music, Edition Peters chose PRIAM Business Software. With systems installed in London and New York, Edition Peters are extending the "multi-channel" capability of their system through the creation of an e-commerce site. Featuring a sophisticated music search capability, this will allow members of the public to place orders on Peters using the accessibility of the Internet. The entire content of the web site is fed directly from the back office system. This allows Peters staff to change the information displayed in the web pages without knowledge of HTML or experience of web development. Included is a comprehensive Content Management System allowing staff to publish articles directly to the site. Orders placed on the site are passed in real-time to the back office system and with credit card authorisation and charging, the whole order taking processes is completely automated for maximum efficiency. Glyn Carvill, commercial director at PRIAM Software said, "It's particularly gratifying to see such a well respected and established business as Edition Peters embracing new technologies such as e-commerce to drive their business forward." "The impending launch of the new web site and the development by PRIAM of a new Royalties system will allow our business to take a great leap forward. We are so delighted with the PRIAM system that we are planning to install it in our Frankfurt offices." .Nicholas Riddle, Managing Director of Edition Peters.